If your soul drowns towards to physics, but the heart belongs to the sky, then it is not difficult to determine that you could be an astronomer. Using physical laws, they study cosmic phenomena to establish how the cosmic space and its components have evolved. The primary object of study is light: all conclusions are drawn about what is happening in the universe on the basis of light data. Astronomers are interested in planets, stars and galaxies, and how they can be achieved and studied. Astronomers are excellent technical specialists because their instruments are high-tech devices. Are you inspired? Then you need to be ready to immerse yourself in higher mathematics, mechanics, statistics. They will be studied at first, therefore at the beginning astronomy programs are not much different from the programs in physics or mathematics. Objects like astrophysics and work in the observatory often begin after the study of basic disciplines. The emphasis in training the profession is on methods of collecting astronomical data in observatories. Therefore, when choosing a university pay attention to whether he is cooperating with observatories and research institutes, where students practice. Most of the best astronomical faculties were created precisely on the basis of such scientific institutions, or vice versa – the observatories grew up where qualified personnel were trained to work in them. Today, many universities note that future first-year students are becoming more pragmatic, they are increasingly approaching the choice of the profession and are increasingly asking a reasonable question about who they will work at the end of the study and how much they will earn. There are two main ways to study astronomy. The first one is for those who have firmly decided to become an astronomer and carry out scientific research. He has to go through the magistracy and graduate school, after which you can continue to work in the observatory. A related field of activity can be called work in government institutions, defense and space-related enterprises. Also, having a high qualification, you can become a teacher, of course, not only astronomy itself but also physics, mathematics, computer technology. Astronomers who seek to popularize scientific knowledge work in planetariums and scientific museums. Those who decide not to associate their activities with science can become IT specialists, engineers, work in the field of private industry, open their own business. In all cases, the salary of such a specialist is an excellent incentive to go to study in this specialty. What kind of program should a future bachelor, master and astronomy doctor choose? The sooner a future specialist plunges into an interesting area of knowledge, the better. Because to enter the Master’s and PhD programs in astronomy, you need to have a solid background in this area. It must be remembered, however, that there are fewer scholarships for bachelor’s programs than for higher levels of study. Entering here, you can count on a long-term perspective: after the bachelor’s program, master’s and graduate programs are offered, the organization of which is carried out jointly with the Institute of Astronomy. Why is it Hawaii? At least because on the largest island of the Hawaiian archipelago with the speaking name Big Island is located one of the largest observatories in the world – Mauna Kea. It is built on top of the same sleeping volcano. Another observatory is on the neighboring island of Maui is Haleakala. Observatories cooperate with the university, which also has its scientific park. A list of courses and terms of admission can be found on the university’s website. The cost of training is about $10,000 per semester. 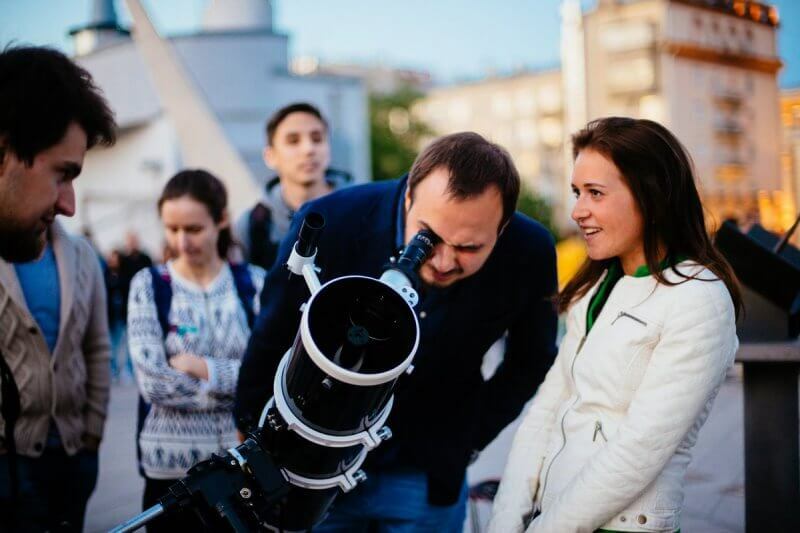 This university offers a whole range of astronomy programs, including in combination with various scientific fields that are not directly connected with it. The most extravagant possibility is to get a Bachelor of Arts and Science degree, that is simultaneously humanitarian and natural science, with the possibility of in-depth study of astronomy. Instead of a standard three-year training period, the program is designed for four years, but the variety of subjects worth it. If you want something more classical, that is, a three-year program of natural science bachelor’s degree in astronomy and astrophysics. To enter this or other programs, IELTS will be required with a score of at least 6.5 and at least 6.0 for each section of the exam (listening, writing, reading, speaking). Submission of documents is carried out online. The cost of training – about 16,000 AUD per semester. The program for astronomy is quite easy to find in the US universities, Texas – just one example. The University of Austin has its observatory, which is a big advantage for future astronomers. To get acquainted with the program and the conditions of admission (it is necessary to pass the examination in mathematics) it is possible on the website. For many bachelor’s programs at the university, including for the specialty “astronomy”, the program of dean’s encouragement to the best students operates. It gives an opportunity to receive a diploma with distinction and already from the first training cycle to work on a research project under the scientific supervision. More information can be found in a special section. The master of astronomy is usually designed not only for those who have received a bachelor’s degree in this field. The physicist, meteorologist, and mathematician can become an astronomer at the magistracy stage. Here specialize in three areas: cosmology, solar physics and extragalactic cosmology. During the research, the data of the Northern Optical Telescope and the Swedish Solar Telescope located in the Canary Islands are used. The master’s program is designed for two years, the language of instruction is English. A significant plus of a master’s program in Norway is that study here is free. However, when applying, you will need to confirm your financial solvency to qualify for a place in the hostel. Applications from applicants are accepted from October 1 to December 1. But you can not apply, being a bachelor’s student, you must have a diploma in your hands. You will also need a certificate of knowledge of English. Another version of the free two-year master’s program in astronomy in English is offered by the University of Turku. The students of the last year of the magistracy have the opportunity to spend part of the study time for scientific work with the Northern Optical Telescope at the Roque de Los Muchachos Observatory in the Canary Islands. Students are also given access to the equipment of the European Space Agency. Documents are accepted from December 1 to the end of January, and studies start in September. Unlike Oslo, you can file documents here, being a student of the last year of a bachelor’s degree and not having a diploma in your hands. In this case, you need to provide a certificate of progress from the university. Like any Erasmus Mundus program, the AstroMundus Master’s program is an opportunity not only to master the chosen profession but also to learn at once in several European countries. In the first semester students study in Innsbruck, the second semester is held in Rome or Padua, the third – in Rome, Gottingen or Belgrade, the fourth – in any of the partner universities. The partners of the program are the Belgrade University, the Belgrade Astronomical Observatory, the Observatory of Padua and Rome, the INFN-Gran Sasso Institute of Science (L’Aquila, Italy), the Max Planck Institute (Gottingen, Germany). Recruitment for the program is from August 1 to the end of November; classes begin in October. Candidates must have a bachelor’s degree in astronomy, astrophysics or mathematics and have excellent English. There is an opportunity to receive a scholarship to cover part of the cost of the program, transportation costs, as well as monthly payments. This section will be of interest to those who dream of an astronomical career, for the way to the observatory and research institutes lies precisely through doctoral studies and serious scientific work. PhD-programs are not educational in the full sense. They most often imply the conclusion of a three-year paid contract, during which the young scientist conducts his research project. International Max Planck Research School (Germany) on astronomy and astrophysics. The program is implemented in cooperation between the Institute of Radio Astronomy and Universities of Bonn and Cologne. The opportunity to get funding for your research project on this program is available to successful students from all over the world. It is necessary to have a Master of Science diploma, and the master’s thesis must be protected in the field of physics, engineering or adjacent to them. You also need knowledge of the basics of astrophysics and English. Deadline for application is November 15 of each year; the contract is possible for any month of the year following the year of application. It is recommended that you carefully review the list of scientific fields that are of particular relevance to this program, and contact potential scientific leaders to discuss the topic of the future study. After reviewing the dossier, the best candidates will be invited (in person or an online format) to an interview or presentation of their master’s project. About the already mentioned university in Hawaii is worth remembering in the section for doctoral students. The university has a special Astronomy Graduate Program, designed for masters and PhD students. Students enrolled in the PhD program can immediately be “assigned” to the research labs of Manoa, Maui or Hilo. They get access to the observatories of Mauna Kea and Haleakala, considered one of the best located due to the properties of the local air: it is clean and dry, which allows for more efficient observation. There are several opportunities to receive funding for their activities at the university: scholarships, including the NASA scholarship, and teaching to undergraduate students. To become a member of the program, you must fill out an online form, attach a motivation letter to it, describing your experience, interests, achievements, and the result of the GRE. Letters of recommendation should be sent online, and a package of documents – by mail, at the address: Institute for Astronomy, Astronomy Graduate Admissions, 2680 Woodlawn Drive, Honolulu, HI 96822, USA. Previous ArticleHow to Get a Doctorate (PhD) in the USA?Next ArticleHow to Write a Review Principles?